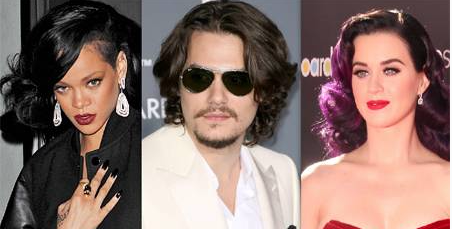 Rihanna spotted having drinks with BFF Katy Perry's ex John Mayer. EXCLUSIVE: John Mayer Spotted With One of Katy Perry’s Best Friends – Rihanna! It would appear Rihanna just broke the first rule of friendship. The Barbadian beauty was spotted hanging out—and getting cozy!—with John Mayer, just weeks after he called it quits with her BFF Katy Perry! An onlooker tells In Touch the pair were spotted drinking together at the Soho House in West Hollywood on April 1. “John and Rihanna appeared very friendly in a corner of the swanky rooftop club,” the eyewitness tells the mag. And it must’ve been some hug! The onlooker added Rihanna was “all smiles” when she left with her bodyguard almost an hour later. unless i see a blurry phone pic or two taken by this "onlooker", i don't believe this story.